P&O HAS BEEN LEADING THE WAY IN CRUISING in Australia since 1932. As the region’s largest and longestserving cruise operator, more than half a million guests choose to spend their holidays on board one of P&O’s five ships every year. 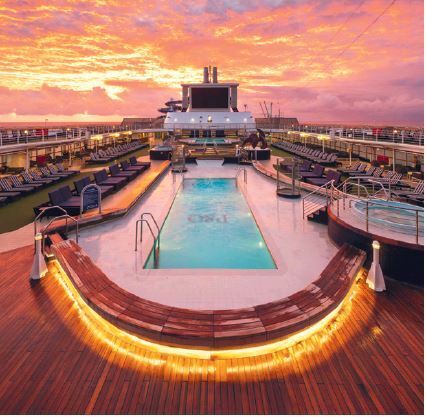 And with ships cruising from six home ports in Australia and New Zealand to destinations around Australasia, Asia and the South Pacific, including Papua New Guinea and the Solomon Islands, more and more people are choosing to take a cruise as their preferred holiday option. As one of the fastest growing sectors in tourism, cruising is also a competitive industry and to stay on top, P&O takes its customer service seriously. It does this by tailoring its customer service to meet individual guests’ requirements and expectations – starting from the time they book their holiday until the moment they leave the ship. P&O’s aim is to ensure staff listen closely to guests and respond to requests as quickly as possible – with the objective of delivering something that is special, unique and memorable, and resolving any concerns the first time. As multiple teams often need to work together to resolve an issue, teamwork is paramount at P&O. Therefore, the company employs staff, from onboard crew to contact centre agents, who are team players, empathetic, and have a genuine desire to put the customer first. P&O Cruises: an experience like no other. Isn't it time to get away?